23 February 2016, Nürnberg, Germany: Toradex is pleased to announce a new member of its System on Module (SoM) product line based on the NXP® i.MX 7 series applications processors. The processors offer an excellent performance/power ratio, advanced security features, and a heterogeneous multicore architecture based on ARM® Cortex-A7 and Cortex-M4 cores, which make the platform a perfect fit for products targeting the rapidly growing IoT market. Connectivity: CAN, Ethernet, USB, I2C, UART, etc. Multimedia: Touch, RGB, Camera Parallel Interface, Analog Audio, etc. The additional Cortex-M4 core is tailored for time-critical applications. This unique heterogeneous multicore architecture allows to clearly separate real time tasks from any server or GUI-related applications. The i.MX 7 processor also includes many additional security features such as secure boot, cryptographic acceleration and tamper detection, which are of high value for the IoT market. Toradex's internal benchmarks prove the effectiveness of the new architecture used for i.MX 7 processors. 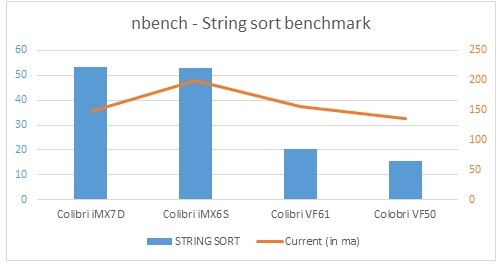 While the performance is comparable to the very successful i.MX 6Solo processor (ARM Cortex-A9 1GHz) SoC, the power consumption in operating mode is in the range of the Colibri VF61 (ARM Cortex-A5 500MHz) or less than 75% of the power consumption of i.MX 6Solo. When looking at the standby mode, i.MX 7 requires even less than a third compared to the power consumption of i.MX 6Solo. The Colibri iMX7S/D SoMs are an extension to the robust and compact Toradex embedded computing SoMs and customized Single Board Computers (SBC), which are used in variety of industries such as industrial automation, medical, automotive, robotics and many more. Toradex’s products are ideal for quickly creating proof-of-concepts as well as scaling seamlessly from prototypes to tens of thousands of devices, without the need to redesign the embedded computer. “We are happy to be one of the first companies in the world providing a product based on the NXP i.MX 7 series. This processor offers an upgrade path from our pin-compatible VFxx-based platforms while retaining the unique combination of two different cores on the same die. By controlling sensors and actuators through the Cortex-M4 core and running non-time critical tasks on the Cortex-A7 core, many customers can massively reduce both the system complexity and the BOM cost. This great product is another result of a longstanding and strong partnership between Toradex and NXP,” said Stephan Dubach, CEO, Toradex. “NXP is looking to drive wide adoption of the i.MX7, critical to our success are system level board designs from our partners that enable our customers to effectively accelerate time to market. Toradex’s Colibri i.MX7 SoM is a highly efficient, powerful module that offers advanced security features in a small form factor. This combined with an extensive ecosystem, will allow customers to immediate start development and shorten time to market,” said Robert Thompson, Chief Enablement Architect for i.MX applications processors, NXP Semiconductors. Technical details of Colibri iMX7 SoMs can be found at https://www.toradex.com/computer-on-modules/colibri-arm-family/nxp-freescale-imx7. Toradex’s Colibri iMX7 SoMs will be available for sales from February 23, 2016 on the Toradex webshop. Toradex is hosting a webinar on March 09, 2016 with NXP. Register now: Introducing the i.MX 7 System-on-Chip - presented by Toradex and NXP.